Ski in/out 3 BR Luxury Condo on Main St. Hot Tub. Pool Table. Wifi. Amazon Echo. 3 BR, sleeps 10, 3 full baths, 2 floors, pool table, hot tub on private balcony. * BRAND NEW. Total top-to-bottom top-end renovation for the 2014-2015 ski season. * Smart TV's with Comcast/Xfinity X1 Digital Premium lineup as well as Netflix, Amazon Prime, and Hulu access in all bedrooms and living room. Upstairs bedroom suites and living room have 55 inch TV's. * In the HEART of Park City on MAIN STREET. Ski-in/ski-out but right in town in WALKING DISTANCE to all of the best restaurants, coffee shops, galleries, etc. * Free PARK CITY BUS stops right at the building. 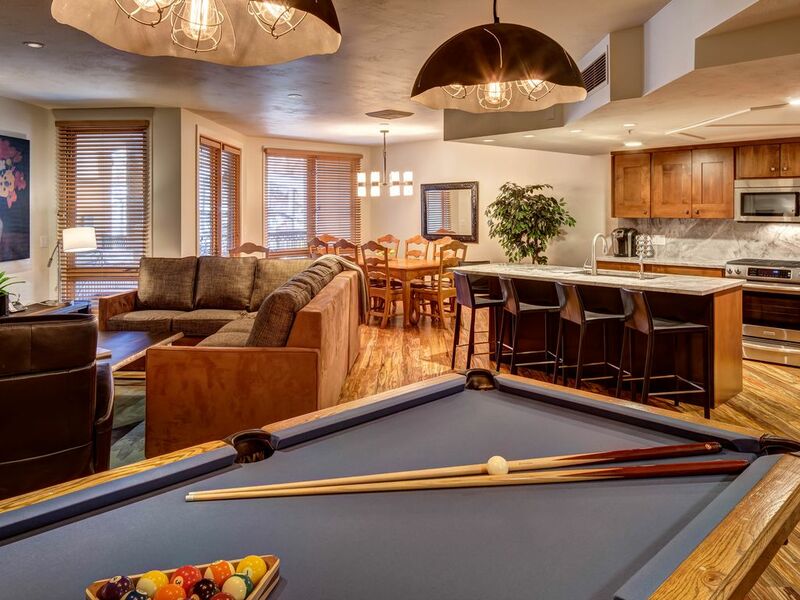 This BRAND NEW (2014-2015 ski season) luxury condominium offers SKI-IN/SKI-OUT access (via the 'Town Lift') to the world-renowned Park City Mountain Resort, a venue for the 2002 Winter Olympics! The Caledonian is considered the most luxurious of the downtown ski-in/out Park City condos. While in the heart of Park City, right on Main Street, we are ski-in/ski-out (50 FEET to the lift!) for Park City Mountain Resort -- a 2002 Winter Olympics venue. Butchers Chophouse & Bar, located on the ground floor of The Caledonian, is a great restaurant open for lunch and dinner that serves wonderful steaks, chops, poultry, seafood and vegetarian dishes along with an extensive wine selection. We are a 10 minute walk from over 100 restaurants & bars and great shopping and have secure underground parking. The location is ideal for the Sundance Film Festival as well as Park City summer activities including golf, hiking, mountain biking, fly fishing, horseback riding, sailing, boating, windsurfing and water skiing -- all within 15 minutes. You are also right on the free Park City bus line which stops right at The Caledonian. Our condo is considered the most nicely appointed in the building. We did a total renovation for the 2014-2015 ski season. It is an oversized 2 floor (nearly 2,200 square feet) luxury condo that has 3 bedroom suites. Master on 2nd floor -- King size bed with pillow-top mattress. Ensuite full bathroom with oversized glass enclosed shower and soaking tub. 55 inch flat screen smart TV with full Comcast/Xfinity X1 Digital Premium lineup as well as Netflix, Amazon Prime, and Hulu access. Home iPhone sound dock clock radio. Second suite on 2nd floor -- 2 queen size beds with pillow-top mattresses. Ensuite full bathroom with oversized glass enclosed shower with dual shower heads. 55 inch flat screen smart TV with full Comcast/Xfinity X1 Digital Premium lineup as well as Netflix, Amazon Prime, and Hulu access. Home iPhone sound dock clock radio. First floor suite -- 1 queen size bed with pillow-top mattress. Attached bathroom with glass enclosed shower done in travertine tile with steam unit. 55 inch flat screen smart TV with full Comcast/Xfinity X1 Digital Premium lineup as well as Netflix, Amazon Prime, and Hulu access. Home iPhone sound dock clock radio. Also, there is a pull out sofa (queen size with inner-spring mattress) in the living room that sleeps 2. The condo has a private 8 person hot tub on the lower balcony, steam shower on the first floor, gourmet kitchen and fireplace. My name is Steve Barsh. I have owned 2 properties in Park City, Utah since 1999 when we started using them for our family and renting them out to guests as well. I am a 'serial entrepreneur' who has worked in high tech businesses for over 20 years. I am a partner in a venture capital firm based in Philly, I perform consulting and acting CxO services to help build and expand great companies, and I teach part-time in the Wharton MBA program. We love Park City, Utah! We love the skiing in the winter where we are 100% ski-in/ski-out for Park City Mountain Resort + The Canyons and Deer Valley Resort is only 5-10 minutes from us. The summer is absolutely awesome as well! There are so many wonderful things to do with our kids here in Park City -- it's a great place to vacation with them. Park City is so easy to get to as it's only 35 minutes from Salt Lake City (SLC) airport. Our condos' location right on Main Street makes it an ideal location for the whole family as we are just steps from everything. It's so convenient. We are 100% ski-in/ski-out (or board-in/board-out for our snow boarding guests) as we are just 50 feet from the ski lift. In the summer, the lift turns into a 'bike lift' for mountain biking access to the Park City Mountain Resort. Being right on Main Street in the 'Old Town' section of Park City is so great as just steps away there are dozens and dozens of great restaurants, cafes, coffee shops, bars, wonderful shops, and galleries. toilet, shower, Glass enclosed travertine shower with steam. toilet, tub, shower, Oversized glass enclosed shower, large soaking tub. toilet, shower, Oversized glass enclosed double-shower. Right on Main Street in "Old Town" Park CIty. 50 feet to the Town Lift at Park City Mountain Resort serving BOTH Park City Mountain Resort and The Canyons (via gondola). Deer Valley is 5-10 minutes by car or free bus. Gourmet kitchen with Keurig coffee maker, 4 burner gas stove, oven, microwave, dishwasher, ice maker, and more! 4 smart TV's all with Xfinity cable with Premium lineup as well as Netflix, Amazon Prime, and Hulu streaming accessibility. Full Comcast / Xfinity X1 premium digital lineup. Private 7 person hot tub on private lower balcony. Our luxury condo is located on Main Street in the greatest area to stay in Park City -- historic 'Old Town.' You get the best of BOTH worlds. You are ski-in/ski-out to Park City Mountain Resort (50 feet to the lift), and you are in the heart of town on Main Street with over 100 great restaurants & bars within a 10 minute walk, great coffee shops, great galleries, great bars, great shopping. This condo has location, location, location! As well, you are on the Park City 'bus route' if you would like to use the free Park City bus. Other Activities: snow boarding, snowmobiling, luge, ski jumping, snow shoeing, bob sledding, fly fishing, live theater. Golf: Consistently ranked as one of the premier public golf courses in the inter mountain region, Park City Golf Club offers a challenging game at one of the state’s most enviable locations. First built in 1963 as a nine-hole course, this William Neff, signature golf course was redesigned to its current 18-holes in 1976. The Summer 2003 opening of an updated #18, redesigned by William Neff Jr., promises to reveal what we believe will be one of the classic finishing holes in Utah. In addition to providing professionally designed and well kept greens, Park City Golf Club’s elevation of 6700 feet can actually add distance to your shots while you play on a course that is typically 10 to 15 degrees cooler than most courses in the area—a definite bonus during the hot summer months. Alta, Snowbird, and Solitude are all about an hour drive away.